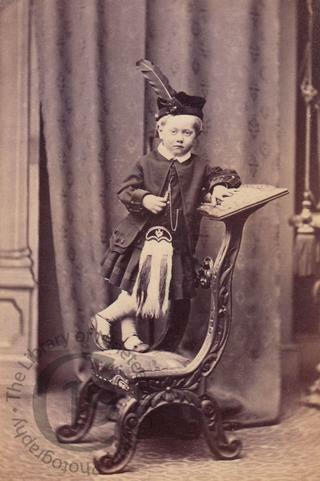 A carte-de-visite portrait of Thomas Hercules Pakenham, seen here wearing a kilt and sporran and sporting a rather fine feather in his cap. Born in 1859, he died in 1877 when he was 17 years old. His father Thomas Samuel Pakenham, who died in 1863, was a JP for County Antrim in Northern Ireland and his grandfather, Reverend Robert Pakenham, was the vicar at Straffen in County Kildare, west of Dublin. Photographed by J. Lee of Liverpool.